I picked this piece of information about the upcoming MAC Cosmetics Hello Kitty collection from Temptalia. So, MAC and Hello Kitty fans in the USA might want to bookmark 10 and 12 February 2009 for the launch of this limited edition collection in the USA and MAC and Hello Kitty fans elsewhere in the world will have to wait till March 2009 to see this. 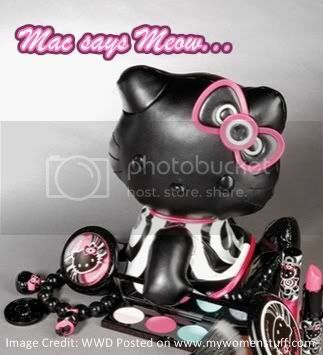 I thought the Mac Barbie collection was quite surreal then, and when I first heard about the proposed collaboration between MAC Cosmetics and Hello Kitty I admit I thought it was a joke. It appears however, that it is NOT a joke and this collection is imminent. I can just hear the squeals of delight from Hello Kitty collectors. One more for the collection! @rinnah : I’ve actually seen Hello Kitty makeup but it was pink and cute and sold in drugstores. @Tine: Ooh I love Dame Edna too – hilarious! I saw the pics – those are cute. @prettybeautiful: I think Hello Kitty is cute, in its way, but not for makeup for some reason. I think it is time for MAC to targeting different personality of gal. Let say Hello Kitty clap..clap… huray!